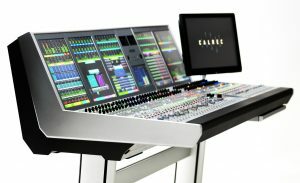 Calrec Audio’s Artemis Ray digital audio console will make its European debut at IBC2017. Artemis Ray has 456 fully featured input channels — making it more powerful than Artemis Beam. Further, Artemis Ray can handle up to 72 faders, the same as the larger Artemis Shine model. Via a brand-new fader/monitor panel, Artemis Ray sports a new surface layout that allows more faders in a reduced surface area. The panel — also available on Artemis Light, Beam, and Shine models — is the same width as a standard Artemis fader panel and includes eight full-size faders to give operators even more control and a higher fader density in a smaller footprint. This configuration saves around 200 millimetres when compared with similar control surfaces. Artemis Ray provides the same functionality as previous Artemis models, but with more channels and faders in the same footprint. In situations where space is at a premium, like in OB trucks, a high fader density is not only desirable, but essential. With the new chassis and fader/monitor panel, Artemis Ray’s 72-fader layout fits into a mere 2372 millimetres (93.39 inches) of space, delivering more power than ever in such a small footprint. Also set to be shown at IBC2017, Calrec’s RP1 remote production unit is a unique live-broadcast product that directly addresses an increasingly prevalent requirement for high-quality content from remote locations. RP1 consists of a 2U core that contains integrated FPGA-based DSP, enabling a console surface at another facility to control all mixing functionality. The RP1 core manages all of the processing for IFB routing and remote monitor mixes, and it does so locally with no latency. This level of integration and remote control makes it simple for any remote mix engineer to set up IFB mixes and eradicates any delay for remote listeners or presenters. The RP1 core quickly embeds audio into existing video-transport mechanisms, while its modular I/O backbone accepts any of Calrec’s I/O cards. This versatility means the RP1 can connect via analogue, AES, MADI, SDI, and the latest AoIP solutions such as AES67, Ravenna, and Dante. At IBC2017, Calrec will introduce a suite of new features on the RP1. These include a 2-band filter and 4-band EQ, expander and gate facilities, compressor and sidechain EQ facilities, direct output for all remote faders (up to 5.1 wide), and remote auxes via Calrec Assist. The new software also provides VCA master control from the host console and pairing of transmission and remote faders so that any fader/cut changes are applied to both TX and IFB paths on to remote faders and remote auxes. A new “blocking” mode prevents the RP1 unit from affecting the paired transmission faders, while the “independent” mode ensures the RP1 can operate independently of the host when required.